A colorful, warm tale full of jokes, drag and tons of sequins. MCC Theater has a big hit with Matthew Lopez’s The Legend of Georgia McBride at the Lucille Lortel Theatre. It’s easy to see why. It’s loaded with lip-synching, drag acts, campy jokes, off-color quips, a love story and tons of sequins. What more can anyone want? 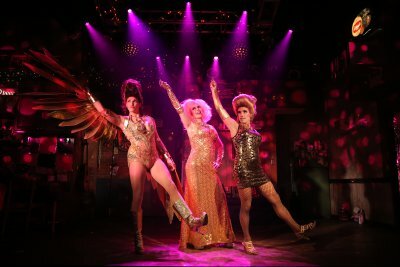 Georgia is the story of down-and-out Elvis impersonator, Casey (Dave Thomas Brown), who inadvertently, and reluctantly, falls into doing drag, surprising himself with the excitement and success he experiences. Lopez gives Casey a heart of gold, if not a talent for making money. He tends to put his rent money into his Elvis costumes, much to the chagrin of his loving—and newly pregnant—wife Jo (Afton Williamson) who yells at him for misusing his debit card to the detriment of rent. They wind up making love. Casey performs his second rate Elvis at Cleo’s in Panama City, Florida, a down-and-out joint run by Eddie (Wayne Duvall), a good-hearted but inept manager/show host. Eddie’s slightly bedraggled cousin Tracy (aka drag artist extraordinaire Miss Tracy Mills—Matt McGrath) arrives tagging along Rexy (aka Miss Anorexia Nervosa, Keith Nobbs who also portrays Jo and Casey’s easygoing landlord, Jason). Eddie promised them a chance to do their act and Casey is unceremoniously informed that his Elvis is leaving the room. At Tracy’s insistence, Casey is offered a bartending position. When Rexy is too drunk to perform one night, Casey is forcibly cinched, padded and ensconced in a not particularly fetching gown to perform an Edith Piaf ditty, hurriedly coached by Tracy in the basics. Soon Casey is repurposing his Elvis jumpsuits into dresses and enjoying a budding career as Miss Georgia McBride. The tips and attention intoxicate him until Jo discovers what he is doing to pay the rent, buy the food and pay for baby expenses. She is shocked and disturbed. This is the climactic moment of The Legend of Georgia McBride, not exactly earth-shaking, but somehow Lopez makes you care for this stage full of oddballs and showoffs. The great fun of watching the show is seeing the transformations of every single person on stage. Even awkward Eddie becomes an almost debonair nightclub host as Cleo’s begins to attract a better and better clientele. Jo and Casey’s relationship grows up and grows stronger. Lopez knows these characters and how they speak. He is helped immensely by his director Mike Donahue who allows just enough comic exaggeration without ever letting the show become a cartoon. Paul McGill’s hilarious choreography for the drag acts is right on target. Donyale Werle’s single set is wonderfully adaptable, changing from the grungy dressing room at Cleo’s to its stage to Casey and Jo’s apartment with just the shifting of a wardrobe rack and a couch. Anita Yavich’s costumes are a show in themselves, maybe a bit too posh for the Panama City venue but a hoot nonetheless. The acting was fine throughout. Ms. Williamson makes the underwritten Jo sympathetic and warm. As Eddie, Mr. Duvall is a treat to watch in his transformation from underdog to successful club owner. Keith Nobbs alternates between always angry Rexy and mellow Jason with ease. Dave Thomas Brown’s Casey/Georgia isn’t as amazing as it might have been, but watching how much Casey he puts into Georgia was fascinating. He has the audience rooting for him. Mr. McGrath, always a charmer, is the standout performer with his graceful, colorful portrayal of a drag performer with a heart of gold. He is always interesting to watch, particularly when he’s helping Casey transform. This is a priceless performance. A very gay, very entertaining tale of love, lust and Sondheim. Kenneth Lonergan comes roaring back with a magnificent new satire about the price of fame, and starting over which brings Timothy Olyphant back to the stage.